The Centennial, a.k.a. East Elk Creek, trail is located in the White River National Forest north of New Castle, Colorado. 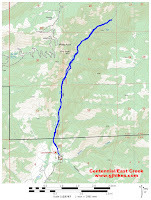 The trail begins at the Centennial trailhead where it follows the road up the narrow East Elk Creek Canyon to the beginning of the East Elk Creek trail #1841. From there a single track trail continues up the canyon passing the former Gray Eagle Gold Mine enroute. Hikers are treated to numerous cascading waterfalls and fresh mountain air as they work their way up the canyon along East Elk Creek. To get to the trailhead from the town of New Castle turn north off of Main Street, or US Highway 6, onto 7th Street which is also the Buford Road or County Road 245. Stay on County Road 245 for about 1.9 miles and bear right onto County Road 241. This is also the turnoff for the East Elk Creek Campground that has some bright read signs at the turn. Follow the paved Country Road 241 for about 3.6 miles to where the pavement ends. Continue along the now well maintained gravel road for another half mile to the Centennial Trailhead. From the trailhead begin hiking up the road where you will pass through the green gate on the right. For a little less than a half mile the road passes through private property that is bordered on both sides by a barnwood fence. Near the half mile point from the trailhead the route enters the White River National Forest. The road that the trail is following is normally passable with passenger cars but most people choose instead to hike it. Several springs that are seeping out of the side of the mountain and onto the road provide just the right environment for columbines to thrive. Picnic spots can be found on the banks of the creek where fishermen and gold panners can try their luck. The road ends less than 2 miles from the trailhead. Trail #1841 begins from that point by crossing a bridge over the creek. The easy to follow trail starts out at a moderate slope spending much of the time sheltered in the shade of tall cottonwoods and pine trees. Wildflowers grow in abundance in the riparian corridor along the creek. This hike was completed in late June and there were already some raspberries that were getting ripe. Some stretches of the trail are set back a short distance from the creek while other parts are hugging the bank near the waters edge. Just past the 2.25 mile point from the Centennial trailhead an old steam engine and tank can be found at the trails edge. Further up the trail on the left there is a long chute of tailings stretching down the mountain from an abandoned gold mine. A pair of cables can be seen laying on top of the strip of tailings that would have been connected to the steam engine and used to run an ore bucket up and down the mountainside. We are guessing that this was the Gray Eagle mine. Within a tenth of a mile of that point there is a short narrow section where the trail has caved off. This spot was pointed out by a warning sign at the trailhead. They may have done a little work to widen the trail since putting up the sign because as you can see in the photo it doesn't look all that bad. Horseback riders may choose to dismount and let their horse go first. As the trail continues it gets a little rockier in places and climbs a few steeper slopes as it works its way up the drainage. Several switchbacks make hiking the steep areas a bit easier. East Elk Creek is making a dramatic cascading plunge down the canyon through here. The pointed mountain in the middle of this photo marks the spot where the Spring Creek trail connects with this one. The thunderous roar of the water echoing off the canyon walls drowns out all other noises. With the creek flowing this heavily a pair of earplugs would have been good to have. There is something wrong though even with the thought of wearing earplugs while on a hike. As the trail continues climbing up the canyon the surrounding peaks and the canyons rims don't tower nearly as high above the trail. The creek at this point is flowing through a narrow gorge where the walls are flat and straight up and down. At the 3.5 mile point the trail crosses the creek to the east bank. At present the bridge is out and when we hiked the trail for this post the creek was swift enough that it would have been a death sentence to attempt a crossing. We spoke with another hiker that said he was here about 20 years ago and the bridge was still there. With as many people using the trail as there are it would be nice to see the bridge replaced. The hike back down the canyon is about as pleasant as a hike can be. There are several short sections of trail that are steep and covered with scree. A pair of trekking poles would really come in handy for those places. They would also be good to have for crossing the creek if the water is low enough that it won't sweep you away. 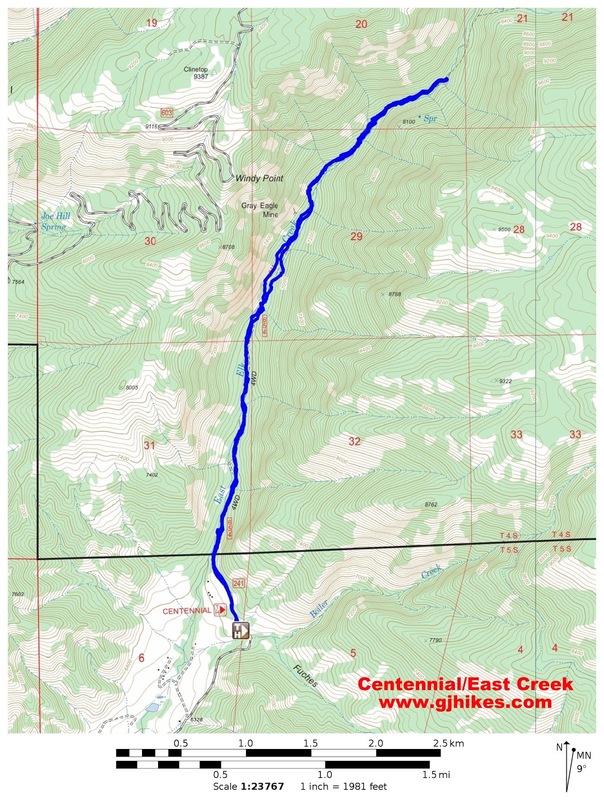 The elevation of the Centennial trail can make it 10-20 degrees cooler than the valleys below. In many areas a mist of water rising from the turbulent waters of the creek can be felt making it seem even cooler. It does take a lot of energy to hike up the canyon so be sure to take plenty of water to drink. Don't let the fast flowing water make you think that it is safe to drink without filtering though. There are plenty of cows and wildlife in the Flat Tops area where the water is coming from and that correlates to a lot of nasty bacteria. The Centennial trail is easy to access and a very enjoyable hike. If you would like to see it for yourself then all you have to do is 'Take a hike'.